Deaf Centre Manitoba Inc.: Royal Manitoba Theatre Centre will offer ASL Interpreted performance- Di and Viv and Rose for March 13th! 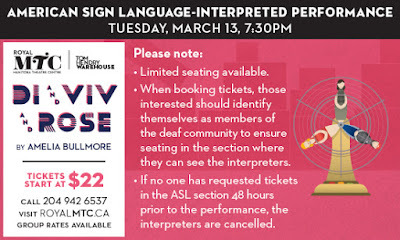 Royal Manitoba Theatre Centre will offer ASL Interpreted performance- Di and Viv and Rose for March 13th! When Di and Viv and Rose meet in university, little do they know they’ll form a lifelong bond. But friendships, like any other relationships, can be complicated. Delve into this heartwarming comedy that celebrates life, love and everything in between accompanied by lots of laughs. Please encourage people to book early as a limited number of seats are available for this performance. Those interested should identify themselves as members of the Deaf community when they book their tickets to reserve seating in the section where they can see the interpreters. To book tickets, please contact our Box Office at boxoffice@royalmtc.ca or (204) 942-6537.